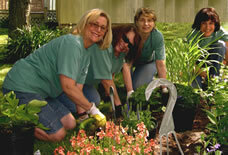 Whether you have a green thumb or not, we would appreciate your help. There are countless ways to lend a hand including: administrative tasks; vendor coordination; planting and tending completed gardens. Please fill out the following information, and we will be in touch soon. *Your name: A value is required. *Your email: A value is required. How would you like to be involved in Hope in Bloom? No experience is necessary to plant gardens. Garden installations generally take four to six hours. How far can you travel to plant a garden? How did you learn about Hope in Bloom? We do not share your information with other organizations.